The Hawthorn Town Hall has been part of community life in Boroondara since it was built in 1888, housing the post office and police station as well as hosting debutante balls, early moving picture screenings, school prize presentations, monthly craft markets, the Saturday night 50-50 dances and immunisation clinics, as well as formal municipal events. Designed by renowned architect John Beswicke, numerous renovations have occurred since the building’s grand opening ball of 1889, most recently in 2013 when the Town Hall was transformed into the Hawthorn Arts Centre. August 2018 marks 130 years since Mayor, Councillor Thomas Barratt laid the foundation stone of the former Hawthorn Town Hall. To commemorate this event, Town Hall Gallery in collaboration with Hawthorn Historical Society presents Yesterday, Today and Tomorrow, an exhibition exploring the different ways that this landmark building has remained significant to the community adapting to societal changes. President of the Hawthorn Historical Society, Elizabeth Love says, “Everyone has a story about the Hawthorn Town Hall, whether it’s Saturday night dances, immunisation, paying Council rates or attending school speech nights. “This interactive exhibition, suitable for all ages, will bring items from the Town Hall Gallery’s Collection, together with local historic images and memorabilia,” says Elizabeth. The Yesterday, Today and Tomorrow exhibition opened on 7 July and is on until Sunday 26 August 2018, revealing historical photographs, memorabilia and artefacts from the Town Hall Gallery Collection. Items on show include the Hawthorn Council Deeds Box, keys to the original Town Hall, as well as postcards, photography and other memorabilia dating back over 100 years. In conjunction with the exhibition, stories from the community about the Hawthorn Town Hall will be shared in a video. Spanning three gallery spaces, Town Hall Gallery features a diverse range of contemporary public programs, curated exhibitions and drawn from the Town Hall Gallery Collection, celebrating the rich cultural heritage of the City of Boroondara. Part of the Public Galleries Association of Victoria, Town Hall Gallery supports local, national and international artists at varying stages of their careers and offers a space for local artists and community groups to exhibit professionally on the Community Project Wall. Featured image: Hawthorn Town Hall and Burwood Road, before 1911. Liz Tronson Postcard collection. (Image courtesy Hawthorn Historical Society). The foundation stone at the front of the building on Burwood Road is really a time capsule. A document was sealed behind the foundation stone when the then Mayor Cr Thomas Barratt, laid it on 7 August 1888. It detailed a list of all past and present mayors and councillors and the history of Hawthorn from its inception. This Town Hall is not Hawthorn’s first. Hawthorn’s first Town Hall (1861) occupied the same Burwood Road site. It was a humble single story affair, housing the police, courthouse, library and lock–up, but when Hawthorn was proclaimed a town in 1887 a modest hall simply would not do. The Town Hall design was a result of a competition. The Council raised £9,500 in 1887 and received 20 submissions. Melbourne architect John Beswicke who lived locally in Harcourt Street, Hawthorn created the winning design. Once upon a time there was no clock. The large Second Empire style clock was finally added to the clock tower in 1911. 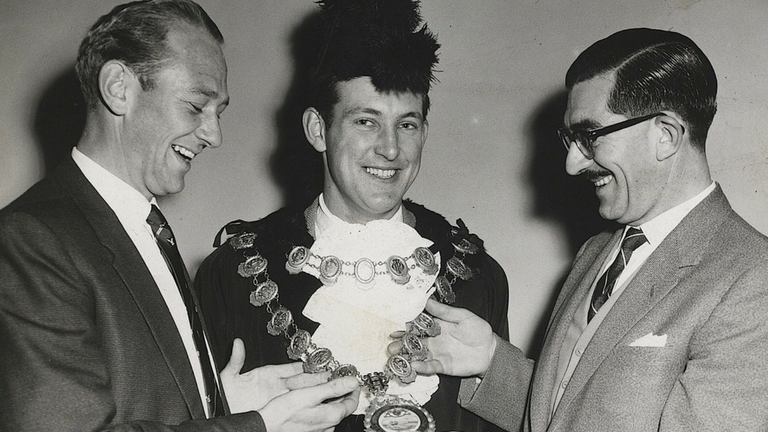 © Hawthorn Football Club captain John Peck dressed as mayor for the day, following Hawthorn’s 1960 premiership. Hawthorn Football Club captain John Peck, as mayor for the day following Hawthorn’s 1960 premiership. (Image used with permission from Hawks Museum, Hawthorn Football Club). © Four dance cards used at the mayoral and charity balls held at the Hawthorn Town Hall. 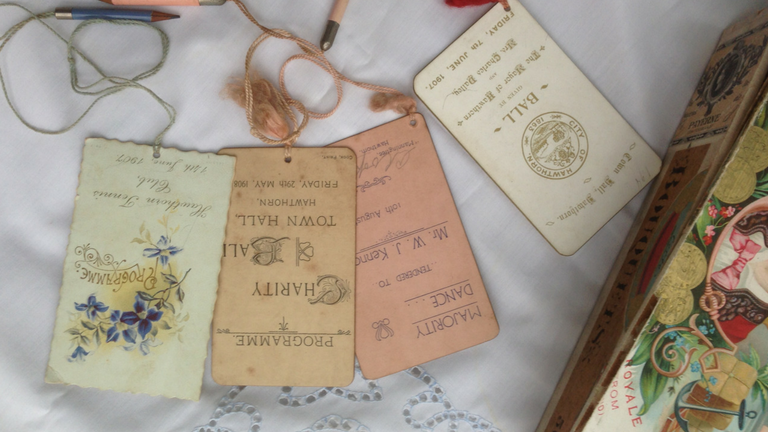 Dance Cards used at the mayoral and charity balls held at the Hawthorn Town Hall. These events were the highlight of the social calendar in the late 19th and early 20th centuries. (Image E. Love Hawthorn Historical Society. Cards donated by Susie Morgan). There's plenty to enjoy in Boroondara this winter both outside and in.